Sara Lynn’s Cakes…not to be confused with Sara Lee…is a family based cake business. We are a mother-daughter team with over 25 years of experience making beautiful, great-tasting cakes in the Quad City area. For us cake decorating isn’t just a job, it’s our passion. We love what we do and want to share that passion with our customers by providing beautifully decorated cakes that are irresistible. It’s this passion, our attention to detail, and great taste that bring our customers back time and time again. Quality is baked into everything we make, and we know you’ll taste the difference! We hope you enjoy browsing our gallery and look forward to taking care of all your cake or sweet treat needs. Just don’t ask for Sara Lee! Sara Newbery: My cake decorating career started as a 4-H project. Soon I began decorating wedding cakes for family and friends. I taught cake decorating classes through Wilton for 17 years. Then, in 1992 I started my own cake decorating business out of my home while raising 4 children. My daughters enjoyed helping and learning how to decorate cakes. In 1996 I joined the International Cake Exploration Societe (ICES) and in 1997 won a cake decorating scholarship to be used in anywhere in the world. As a member of ICES, I served on the board of directors for 3 years. Professionally, I have been trained by two world famous cake decorators, Nicholas Lodge and Klara Johnson. 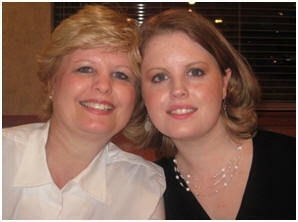 Recently, my daughter, Liz Heesch, joined the business and has become a great source of energy and new ideas. Liz Heesch: I left an office job, and joined the family business full-time shortly after the birth of my first child in the summer of 2009. I have grown up around cakes, and was thrilled to have the chance to become a partner in the business and remain a stay-at-home mom. Spending the last 10 years working part-time with my mother has allowed me to develop the skills required for this profession. I love the attention to detail, and the daily opportunity to learn new methods and techniques. I look forward to working with my mother to transform our small business, based on our passion for cakes, into the preferred cake destination for the Quad Cities. We see ourselves as the hometown bakery, and strive to maintain this status.